You want to cruise on your schedule, not when your engine feels like it. Choosing a marine service team that offers 24/7 emergency field service ensures that you are taken care of wherever your boating adventures take you. 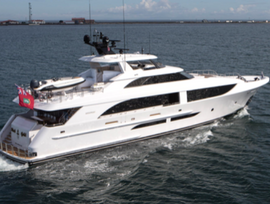 The Pacific Power Group marine service team is not geographically constrained, meaning that we can reach your vessel for service wherever your travels take you, getting you up and cruising faster with as little downtime as possible. It is difficult to fix your engine problem without the proper parts and equipment. With the largest MTU parts inventory in the U.S., Pacific Power Group offers the proper support and exactly the part your engine needs any time of day. Having a proactive maintenance plan helps you foresee problems with your engine, and prevents them from ever happening. With a preventative maintenance plan that includes regular service for your vessel, your engine is always prepped to propel you to any destination. Pacific Power Group has serviced clients as far south as Venezuela and as far north as Alaska. With a service footprint that spans more than 5,700 miles, a service location is always within reach and professional support is a mere phone call away. Reliable service can make or break your boating experience. Choosing an experienced service provider like PPG with years of industry experience, and a team of trained engine technicians is the best way to ensure that your boat is sea-ready.